A CR10 accessed by RF telemetry at North Huntington Reservoir allows the district manager to control the headgate from Castle Dale, 13 miles away. In an era when water is becoming a precious resource, the Emery Water Conservancy District is taking steps to preserve its water rights. Headquartered in Castle Dale, Utah, the district was established in 1961 to oversee the Emery County Project, which entailed the construction and management of five major structures: Joe’s Valley Dam and Reservoir, Huntington North Dam and Reservoir, Cottonwood Creek-Huntington Canal, Huntington North Service Canal, and North Canal. Now complete, they provide supplemental irrigation to 18,000 acres and full irrigation to 770 acres. The annual precipitation for this area of Utah is 8.5 inches, falling throughout the year. Water supply sources for the district are Cottonwood Creek, stored in Joe’s Valley Reservoir, and Huntington Creek, stored in Miller’s Flat Reservoir. Both Huntington and Cottonwood Creek are tributaries to the San Rafael River, which is in the upper Colorado River Basin. Since its inception, the conservancy district has shouldered new responsibilities. In 1993, the county commissioners approved a property tax increase which financed a monitoring system to document both the quality and quantity of water as it enters and moves through the county. The Bureau of Reclamation assisted the conservancy district to specify and install the new instrumentation. The first 16 CR10-based stations were installed in 1993. Currently, 53 stations record water level and quality parameters at 2 reservoirs, 14 canal sites, 2 pipelines, 16 springs, and 9 culinary stations. Water level is measured by a variety of sensors including resistance tapes, ultrasonics, bubblers, shaft encoders, and strain gage submersible pressure transducers. Water quality is measured in the rivers and streams by model 247 conductivity probes to estimate salinity. The conductivity probes, together with flow meters, are also mounted in the city’s water supply pipes. Meteorological impacts on the district’s water supply are monitored by three weather stations. Each morning, data are automatically collected via RF telemetry. The district’s RF system consists of an RF232 base station, a computer running PC208 software, three repeater sites, and radios at each station. All field stations are equipped with RF100 or P50 radios, RF95 modems, and frequency-matched antennas. The CR10’s low power requirements allow most sites to be powered using solar panels and sealed rechargeable batteries. Scheduled data collection occurs each morning, but sites can be called at any time to assess conditions. Many gauging stations, such as Swasey Diversion, use a shaft encoder to monitor water level. The datalogger, power supply, radio, modem, and encoder are housed within a stilling well, while the antenna and solar panel are mounted externally. As the float moves up or down with fluctuating water level, the CR10 records the pulses transmitted by the encoder. The office computer automatically polls for the data, providing updated information for the manager each morning. 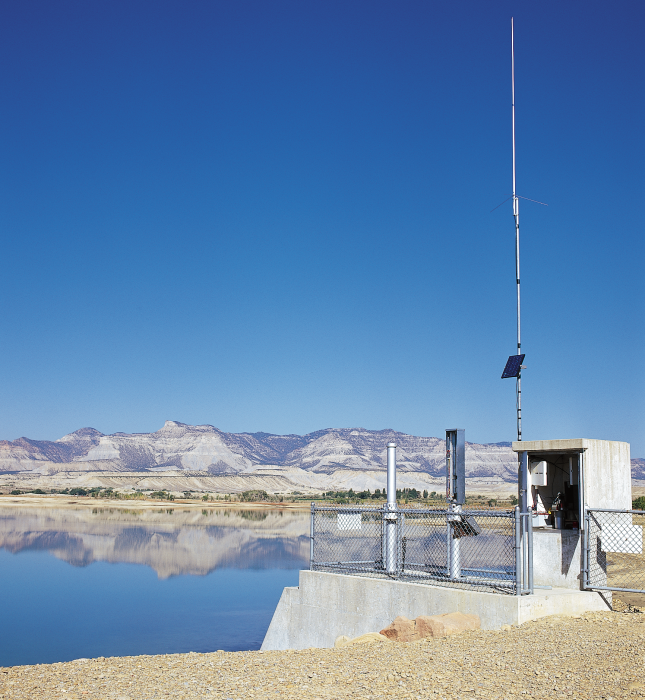 The Swasey Diversion Dam was upgraded in the summer of 1996 to handle flood conditions by raising the height of the dam, adding a pressure transducer, and programming the rating curve into the datalogger. Typical releases into Cottonwood Creek are 150-170 cfs, but on September 12 when a flood hit, a peak of 2900 cfs was released. The control system performed flawlessly, and all of the outflow adjustments were made by the datalogger. Water level data from North Huntington Reservoir are also used to make irrigation control decisions. Each morning after the levels of the reservoir and its outflow canal are checked, the district manager adjusts the position of the headgate via RF to meet water orders. The conservancy district has purchased five additional stations to expand their monitoring network; they are scheduled for installation this summer. They are currently looking for additional sources of funding to maintain the hardware and the historical data acquired by the monitoring program. But for now, their determination to protect their limited water supply is an indication of the value of this precious resource.